Finally, there's a hoof conditioner and toughener that's also a show quality cosmetic. And that's a tough combination to beat. It's called TUFF STUFF. And it's so effective that, after treating an egg with it, you can actually drive a nail through without cracking the shell.Of course, if it works like that on an egg, think how well it will work on a horses' hooves. To strengthen brittle, shelly, mushy or cracked hoof walls. To guard against fungus, caustics and bacteria. To maintain the hoof wall's natural moisture level. 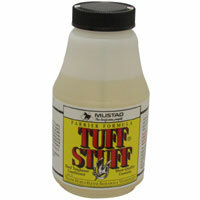 TUFF STUFF helps make a horse owner's life easier, and a farrier's job more effective. And it does it like no other hoof conditioner can. Better than external attempts to condition and protect that can wear away after application, like coatings and mud/tar preparations. And more effective than oil-based products that actually block absorption of moisture, TUFF STUFF, is an acetone-based application that moisturizes the hoof from the inside out. And since TUFF STUFF contains a cellulose bonding agent that retains moisture in the hoof wall, the hoof actually gets tougher after every application.